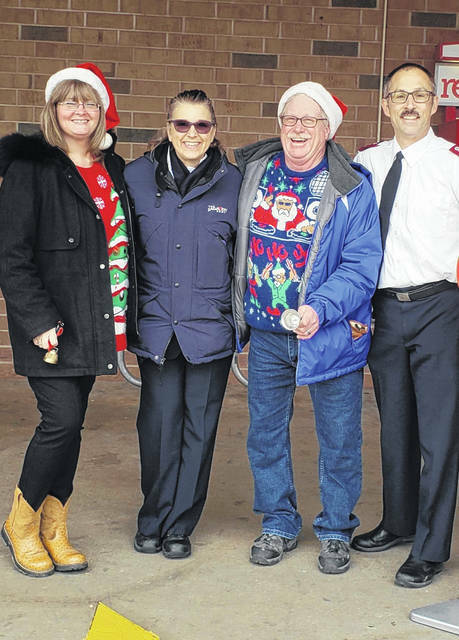 Tammy Chatfield, store manager for The Salvation Army, is pictured with captains Dan and Misty Simco as well as their helper Keith Chatfield. 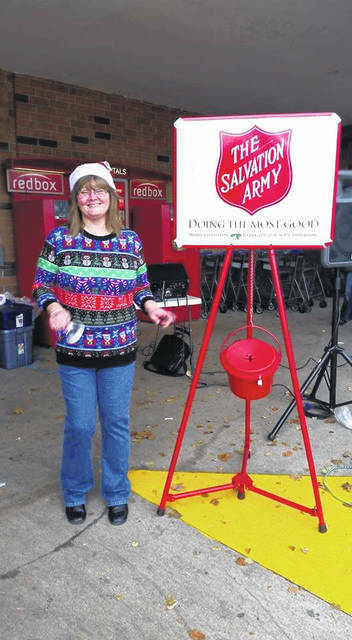 Tammy Chatfield collecting donations for the The Salvation Army. POINT PLEASANT — The cold weather has come to stay in the area and offices within Ohio Valley Publishing and AIM Media Midwest are sponsoring coat drives to help provide warmth to those in need. The Point Pleasant Register and the Portsmouth Daily Times are both sponsoring a “Share the Warmth” winter coat drive for The Salvation Army. The drive will be held until Wednesday, Dec. 19. Donations are needed for boy and girl children, ages zero-18, as well as male and female adults, age 19 plus. Accepted donations can be either new or gently used coats and can be dropped off at either location. According to The Salvation Army’s website, The Salvation Army is an international organization that meets the needs for individuals without discrimination. Members of The Salvation Army assist approximately 25 million Americans annually and serve in 130 countries around the world. The Salvation Army has over 1.5 million members consisting of officers, soldiers, and adherents. The basis of this organization began over 150 years ago. In 1852, William Booth, a minister in England, gave up traditional church concepts and sought to spread the gospel of Jesus Christ directly to the people. Walking the streets of London, he preached to the poor, the homeless, the hungry, and the destitute. When fellow clergymen disagreed with Booth’s unconventional approach, he and his wife Catherine withdrew from the church to train evangelists throughout England. The couple returned to the East End of London in 1865, where many followers joined their fight for the souls of lost men and women. Within 10 years, their organization, operating under the name “The Christian Mission” had over 1,000 volunteers and evangelists. When Booth read a printer’s proof of the 1878 “Christian Mission” annual report, he noticed the statement “The Christian Mission is a volunteer army.” Crossing out the words “volunteer army,” he penned in “Salvation Army.” From those words came the basis of the foundation deed of The Salvation Army. From that point onward, converts became soldiers of Christ and were known then, as now, as Salvationists. Today, The Salvation Army is active in virtually every corner of the world, offering the message of God’s healing and hope to all those in need. Some information from https://www.salvationarmyusa.org was used in this article.